Limited Edition of 150 Copies on Clear with Black Splatter Vinyl. 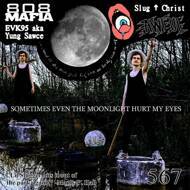 The definitive limited-edition vinyl release of Slug Christ's "Sometimes Even The Moonlight Hurt My Eyes" is here. Produced by EVK95 (808 Mafia) and only previously available digitally via Awful Records, this vinyl release comes with 3 bonus tracks!